Fans who did not get the chance to own a pair of the original Air Max 97 that debuted in 1997 are very pleased with the comeback of the Nike Air Max 97 OG Metallic Silver. A huge number of reviewers raved about the ever striking metallic wavelike curves of the Silver Bullet. Loyal Air Max fans, copped this retro as it brought them so much nostalgia. The sneaker’s chrome-like and pearl finish is truly exceptional, according to Air Max enthusiasts. Ideal for night running as one can be easily seen when they go flying like a bullet with this sneaker. Its lacing system makes the Air Max 97 OG Metallic Silver more attractive. It’s great to have a pair of kicks that has so much history behind it. Buyers said the Nike AM 97 Silver Bullet is true to size. The mesh material that makes up the tongue is very soft to the touch. Very comfortable with the full-length air bladder underneath. The thick insole of the Metallic Silver version of the Air Max 97 OG is very comfortable. Not many retailers released online during its launch, making it hard to cop a pair. There are few visible brush strokes on the white portion of the midsole. By closer inspection, a reviewer noticed that the laces of the shoe are worn on the edges. One reviewer noted some glue stains on the upper. The AM97 OG Metallic Silver is an expensive pair of retro sneaker. The 360-degree metallic finish of the Air Max 97 OG from Nike remains a standout among sneaker lovers who have witnessed the birth of this beaming icon back in the day and waited for its comeback. The fine detailing on its silvery upper complemented by its cushiony Air Sole bubble on the sole gives this shoe a classy and sporty edge. With several technologies and rich stories interwoven in this shoe, it deserves a special spot in the shoe closet as it is a worthy investment. The nostalgic and luxurious looking Nike Air Max 97 made its global reappearance in the Summer of 2017 in celebration of its 20th Anniversary. Clad in the same OG metallic cover called the Metallic Silver (also known as the Silver Bullet to many fans), with hits of Varsity Red, the Nike Air Max 97 OG re-emerged in its ever striking silhouette that drew attention from sneaker enthusiasts and Air Max loyal fans. Just before the Air Max 97 spiked up a fever in retailers worldwide, limited releases of the original stunning Silver Bullet were made available at selected outlets in Italy in December 2016. Much to the delight of the Italians, this special edition of the AM97 had red/green/white combo for the tongue and heel pull tabs, which are the colors of their national flag. When this version of the Air Max with a visible full-length cushioning unit in the sole was unveiled in the late 1990s, its sales instantly ballooned in the Italian market and across Europe. Nike took note of it and linked up with the Italian community as a focal point for significant anniversary date releases of the Air Max 97. The Air Max 97 was later called “La Silver,” referring to the Silver Bullet profile. When the Nike Air Max 97 turned ten in 2007, the glittery OG silhouette made its return to the center stage through exclusive drops in Italy and at NikeTown outlets where a huge population of Italian tourists usually converges. Perhaps, the Europeans’ affinity towards this shoe with a very unique profile can be merited to Tinker Hatfield’s fondness over the extraordinary Les Centre George Pompidou in Paris. This building was the design inspiration of Hatfield when he conceptualized the Air Max 1, the very first Nike Air Max sneaker with visible Air Sole cushioning in the sole. 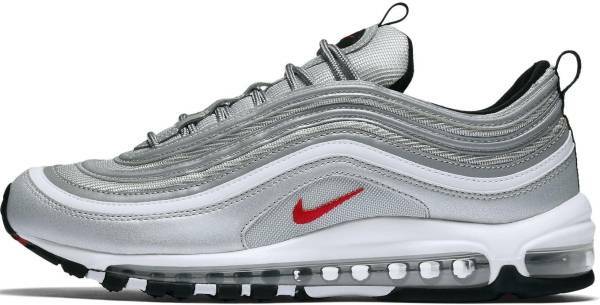 Since the Air Max 97 was launched back in the day, Nike referred to it as the Silver Bullet, in relation to the Shinkansen or better known as the Japanese bullet train. It was said that the metallic waves on this sneaker refer to the fluid movement of the famous super high speed railway network. According to Christian Tresser, the creative genius behind the radiant Air Max 97 masterpiece, he wanted to narrate a story through this sneaker. In one of the rare interviews with this designer, Tresser said that his creative concepts are normally pulled from nature. For this specific sneaker with full-length revolutionary Air Sole technology, Tresser explained that a brainwave of ideas flowed upon him after seeing a drop of water in a pond that created a rippling effect. He used such idea in conceptualizing the AM97’s upper. In his 1986 sketch of this shoe which he called the Air Total Max, Tresser an avid competitive cyclist revealed that its metallic colorway was lifted from the silver and titanium finishes of a mountain bike. During that time, mountain bikes were so popular and were given a lot of decorative and high corrosive-resistant metal finishes. Tresser thought that this would be an interesting component to complement the maximum cushioning project he was tasked to create. In his initial drawing, he specified the use of 3M reflective material for the upper. He also wanted white segments in the shoe, but instead of a flat white element he incorporated a pearl luster effect in it. Placing all these features together, the Air Max 97 was born, a year after Tresser first envisioned this futuristic beauty. In the same year, the Silver Bullet was dropped, this icon’s less sparkly but solid appearing siblings were unveiled as well, the Navy/Volt and the Royal Blue colorways. It took two more years for the Air Max 97 to receive another lustrous finish with the drop of the gold colorway in 1999, which was called the Metallic Gold. The multiple layers of reflective 3M strips, leather, and mesh with shades of silver, white luster, and gray definitely calls for attention. The entire profile of the Air Max 97 OG Metallic Silver is as glittery as the 1997 version of this shoe and radiates under broad daylight and glows at night time. Its sporty rendition with hints of sophistication goes well with track suit-loving individuals and those who are comfortable with loose pants with tight edges. The Air Max 97 OG Metallic Silver has a non-traditional lacing system with silver metallic laces in standard rope style. It is somewhat concealed in the throat area yet provides the customized secure fit. This unisex sneaker generally runs true to size which gets narrow towards the toe box. Those with wide foot measurements are recommended to go half a size up as well as those who prefer a roomier toe box. The men’s sizes range from 6 to 13 US, and the women’s sizes are from 5.5 to 12 US, with half sizes. The exceptionally striking Nike Air Max 97 OG continues to entice sneaker aficionados who are drawn to its standout beauty, as well as sneaker collectors who are captivated with the shoe’s nostalgic 1990s character. They loved how this ultramodern Silver Bullet with an equally recognizable Air Sole bubble has withstood several stations of development yet continue to fit in this present time. The black insoles with a metallic Swoosh on the heel are completely removable. The original Nike Air Max 97 has tuned air in the heel area in varying pressure units. PSI markings seen at the bottom of the heel of the Air Max 97 stands for pounds per square inch. Both lateral and medial sides have tuned air in 25psi while at the rear side of the heel is in 5psi. The Air Max 97 OG Metallic Silver does not have the PSI markings. The Air Sole technology was innovated by aeronautic engineer Franklin Rudy and was first incorporated in the Nike Tailwind in the 1970s. Aside from the Silver Bullet, Air Max 97 loyal fans are bombarded with more than 13 other variations of this classic yet futuristic sneaker, which includes collaborations with retailers such as UNDFTD, which are dropped on its 20th Anniversary year. Nike came out with a shinier rendition of the 360 degree-reflective Air Max 97 Metallic Silver, in the Swarovski Air Max 97 LX. The black Swarovski version was dropped in the Spring of 2017 and the silver edition in the Fall of 2017. There are roughly 55,690 Swarovski crystals in a pair of this sneaker. Sporty Spice Melanie Chisholm was seen wearing the Air Max 97 back at the height of the Spice Girls fever. American footballer Victor Cruz and rapper Wale were seen clad in Air Max 97 Metallic Gold colorway. Canadian rapper Drake was seen wearing the Silver Bullet Air Max 97.